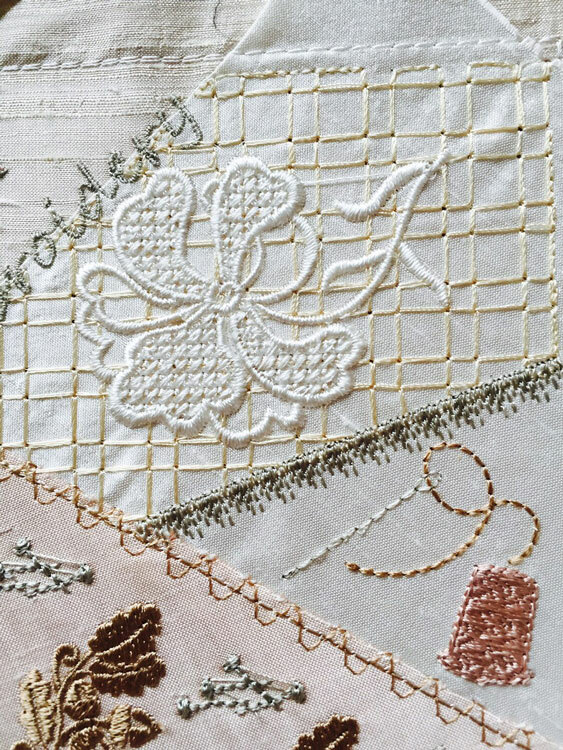 When I wrote last time I had done my test out and was in the process of improving the Romantic Crazy Quilt block which has a sewing theme. I have now embroidered it out again with the cameo and was delighted with the result. 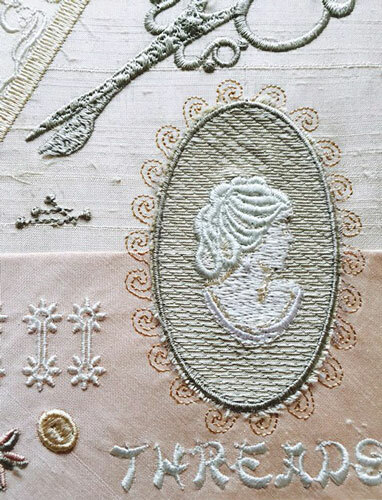 May I stress that it is essential to use the same shades of thread that I have used so that there are only subtle changes in the cameo, which is based on one I was given by my Mother many years ago. I have tried to highlight the slight amber appearance of many cameos. There will be two versions of the block one with the cameo and another with the words “love to sew”. In this test I used ordinary rayon for the scroll border but it works just as well with 30wt cotton, adding some dimension. In this left lower section of the block you can see I have added some tiny cross stitches which sit behind the word “fabric”. Now you may decide to add some patterned fabric instead but the option is there to use these stitches which are added before the next fabric is attached. On this block I did not attach any lace as I had previously done. You can see the line of stitches which will attach lace for you and the guide lines underneath. Here you can see the splendid acorns and oak leaves in detail with the pins which are not so dense. The buttons look much better in Sulky Rayon 1082 and 1127 as opposed to the white I used last time around. Obviously you may choose to use real buttons instead. I have create this block with many thread changes so you can change the colours to suit your theme, and after doing that you may want to thread sort your embroidery design. Keep a copy of the original design though! I have also added some box type background stitches to the top right fabric as these will be so useful for embellishing. 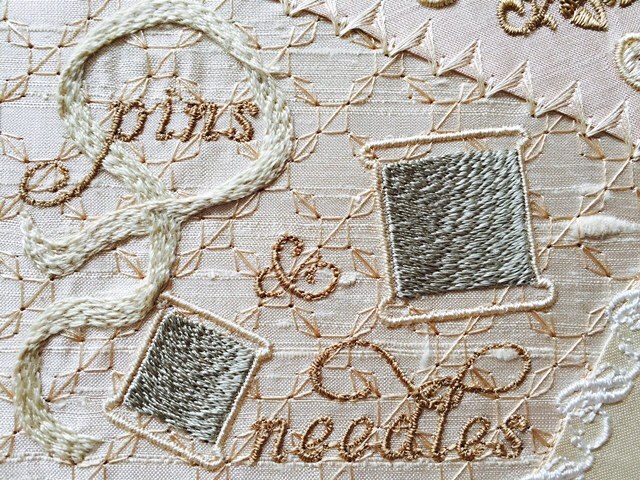 The little jump stitches for the pins may not be picked up on all machines so you need to scrutinise your embroidery to make sure none are missed. Its amazing how they always show in photos. Check you haven’t missed any by taking your work outside and look along the fabric, close up, to see them rather than looking down upon it. 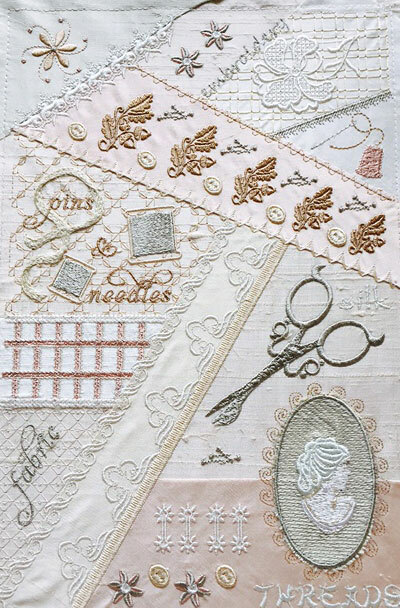 The stitches above the needle and thread were inspired by the markings on a ruler and the zig zag type stitches below are based on the lines sometimes seen on elastic. 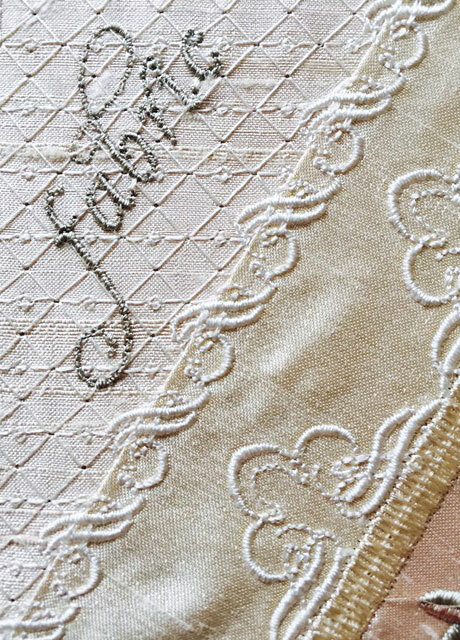 Use them when you embellish to thread narrow ribbon through hiding the stitches beneath. When I stitched out the ribbon which is done in a open weave I used Sulky cotton 30wt variegated thread. As you can see this really gives the ribbon dimension but you need to slow your machine down to its slowest speed as the threads build up on the twists. I had a couple of breakages but it was worth the result. The other alternative is to actually attach twisted ribbon with embroidery floss or silk ribbon by hand. I have seen this done on numerous crazy quilts and was the inspiration for this. Hope you like the modifications on this block. I cannot wait to see what you all create with the block and how you use it. I think as well as making a wonderful picture for your sewing room that it would make a marvellous bag mounted on hessian or burlap. I am sure it would start up some interesting conversations when you are out and about! Unfortunately these pictures do not completely capture the detail, essence and colours of this block but I think you get the idea and I hope they inspire you to create your own work of art. I hope to release the block in the next few days when I have finished the detailed tutorial which accompanies it. 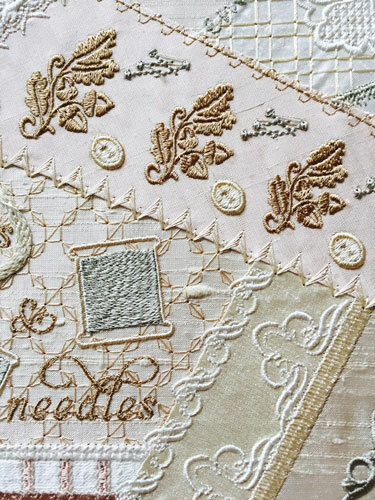 This entry was posted in Discussing machine embroidery, Embroidery projects, New Designs and tagged Crazy quilting, machine embroidery. Bookmark the permalink.